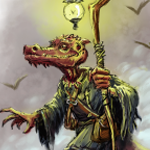 Ask the Kobold, now in Pathfinder flavor! 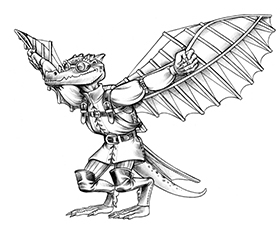 That’s right, folks, Skip Williams will now be answering Pathfinder Roleplaying Game questions in his regular column Ask the Kobold! Is there some aspect of the Pathfinder Roleplaying Game you’re a little fuzzy about? Did you just switch over from 3.5E and just aren’t sure how something translates? Do you just want to try to stump Skip? Whatever the reason, we need you to feed his need to answer questions, and we need it fast! Questions are his only sustenance. Only you can help save the Kobold Sage! Does “listed benefit” mean the complete 4th or 7th level improvements listed, or is it in place of just the ability score improvements? Awesome Skip, thanks for tackling this and good luck! I seem to be having issues with posting this question. Three times on Monday and now this is my third attempt today. Lets see if it works. During a Tuesday Chat with Paizo at Chat.DMTools.org I asked about a Sage Advice / Ask the Kobold style Q&A and James Jacobs said that if they were going to do it, they’d do it in house. Thus, are the answers that the Sagely Kobold gives ‘official’? I can understand that under the 3.5/OGL umbrella they weren’t as they weren’t sanctioned. However, is Paizo now giving KQ/ Skip the OK? Well, official or not, I’ve always trusted Skip’s answers and have one that came up just this past weekend. Mirror Image spell – if a caster casts MI on them-self and during the duration, they do something that modifies their appearance – will the images change as well or do they stay as the caster was when the spell was cast? Such as if the caster picks up a body, or a unique item, or something that is enough to make the person noticeable. Do the images create the ‘thing’ to make them match even after originally cast? Or do they stay as they were at the time of the casting, just mimicking the casters movements. Be Well. Be Well Answered. I am confused how this spell works. Does the touch victim get a save to negate the paraylsis? If so and the save is passed, would there be no need for a save against sickness from those around the victim? Is the save entry meant for the victim touched or those around him? Does the victim never get a save because they must be hit with a touch attack to fall victim, meaning the save only refers to the possible sickened status of those around the victim? Thank you for any insight. I miss reading sage advice from Dragon magazine so much.